I was feeling a bit under the weather when my 1st Blogaversary came and went. Getting on the computer was the last thing I wanted to do. I don't know but this cold hit me hard this time. I'm feeling so much better now, so I wasn't going to let this special day go un noticed. Everyone please join me as I say, Happy 1st Birthday Mommy's Kitchen!!!! I cant believe it has already been a whole year. Last June I started my recipe blog as a outlet and a hobby for my favorite recipes. I never imagined it would turn into something so big and special in my life. I have had a lot of positive things happen to me because of my blog. I never knew so many people were interested in simple family favorite foods. I always wonder who is reading my blog and if all the hard work I put toward each recipe post is worth it. Well, from time to time I get such wonderful emails from readers telling me just how much they love my site. It really makes it all worth while. I am so glad that my site has helped out so many people that want to learn to cook. "Strawberry Shortcut Cake and a Cookbook Giveaway"
To celebrate my First Blogaversay I'm giving away a cookbook!!!!!
" The One Armed Cook "
If you do not have a blog account please leave a email address so I can contact you in the event that you are the winner. Also stayed tuned because I have another big giveaway I am so excited about coming up really soon. Adding sugar and brandy to macerate the strawberries. 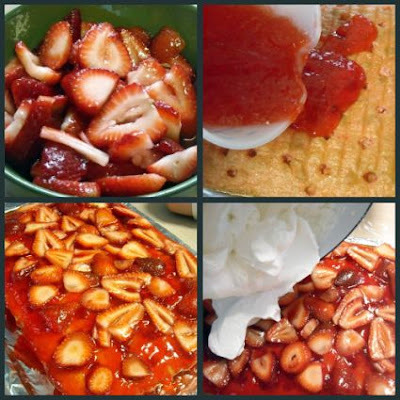 sliced strawberries, pouring on the jello, add those wonderful macerated strawberries. And finishing it off with a topping of Fresh Whipping Cream. Let chill for at least 4 hours and serve. I saw this cake on Down Home with the Neely's another one of my favorite shows. Gina had me wanting to make this cake from the start. I thought it was the perfect treat to celebrate this special day. This cake is really just a new twist on a old family favorite. You cant even tell that brandy was added to the strawberries they turn out so nice and juicy. Preheat oven to 350 degrees F. Follow cake directions as written on cake mix box. Remove from oven and cool cake completely. Meanwhile, in a medium bowl, combine strawberries, cognac and sugar. Let macerate 20 minutes. Invert and release cake onto a decorative platter. Whip cream with confectioners' sugar and vanilla at medium-high speed until it reaches stiff peaks. Do not over whip. Mix gelatin as directed on box. Refrigerate gelatin mix but do not let it harden, it should cool to a liquid consistency. Using a straw, poke holes all over the cake. Pour gelatin into holes and spread over the top of the cake. Spread layer of macerated strawberries on top of cake. Spread layer of whipped cream on top of the strawberries, making pretty swirls and ripples. Garnish with fresh strawberries. Refrigerate for at least 4 hours. Recipe source: Down Home with the Neely’s "A Southern Family Cookbook"
I really enjoy your blog...keep up the good work. I think my daughter in law who just had my second grandchild would love this cookbook. Thanks for posting such wonderful recipes! I am always trying to find new dishes to make and yours seem to never fail. This cookbook sounds awesome, since sometimes that is how my day goes with a little boy and my husband working late hours! Enter me in the giveaway please! Our blog is private so you can email me at craftinchels22@gmail.com if I get picked as the lucky winner! Thanks! Congrats for your Blogaversary!! I'll bet you're excited! I've loved checking out your recipes!! I check your site daily!! I've enjoyed many many of your recipes!! I love your blog! The recipes are very approachable and fun. I saw this cake on TV as well wanted to make it. I love anything with strawberries. Thanks for the opportunity to win the cookbook. Thanks for all your great recipes. I love trying new things. Congratulations on your blogging anniversary! I am so thankful I discovered your blog, and for all of the delicious looking and tasting recipes you share on it. The cookbook is one that I do not have, but would love to. A generous gift on your part. Keep on blogging. Congratulations on your blogiversary!! I stumbled upon your blog about a month ago, and since then have gone back and read every entry! Lots of great recipes for me to try, and many have gotten raving reviews. Thanks for the chance to win the cookbook. I just found your blog, it is awesome!! Love it!! Congrats on your Blogaversary! Thanks so much and have a lovely evening! Happy 1st Blogoversary to you!! How exciting! Your cake sounds delish! Congrats on your blogaversary!! I really enjoy your blog and cannot wait to see the new recipe you have posted. Thanks for giving us great family pleasing meals. From a girl who grew up in Mesquite! happy Blogaversary!! That cake looks so good!!! It's the perfect cake for summers hot weather! I love your blog , you've done a great job!! Happy 1 year anniversary to you! Here is to many, many more! Happy Birthday Mommy's Kitchen. My two-year-old who loves all things pink would LOVE this cake. Love your site and Happy Anniversary! Congrats on your blog anniversary! I love the idea of this cake. I will definately make it! Love your site, have made a few of your recipes and love them. Happy Blogiversary! It is always big pleasure to read your posts. Happy blogiversary! I have been following your blog for awhile now and I just love it! Thank you for all of your hard work! Hope you are feeling better! Your blog is absolutely awesome! I so appreciate the step-by-step pictures that you post along with every recipe. Many times, I have tried out a new recipe and wondered "Is it supposed to look like THAT??" :) I am a mommy to 2 boys under age two and appreciate any help with quick and easy...and TASTY meals! Yours never fail! Your strawberry soda cake was a huge hit in our house! :) Please keep up the great work and keep those recipes comin! And you wonder...is the hard work worth it? We think so!! :) Thank you, thank you! Happy Blogaversary! I just recently found your blog and so far I love it. I am going to try some of your recipes this weekend while my mom is visiting. I would love this book. This looks delicious! I love the Neeleys! Happy one year on your blog! I love picking up great recipes on your blog. I'd love to win the cookbook! Happy Blogiversary!!! This cookbooks sounds like something I need... I have a 10 week at home and already trying to juggle him around in the kitchen. Congratulations on your blogiversary! That's awesome! So glad I found your blog. It feels like home when I visit. ;) Cooking with one arm? Right up my alley! HA! HA! This cookbook sounds like it would be great for young mom's and working mom's. I would love this cookbook. Congrads on making it a year and I look forward to trying many more of your recipes in the next year. I actually found your site by mistake but let me tell you I can't go a day without logging on and checking for a new AMAZING recipe. Thanks again for a wonderful site and so many delicious recipes. Best of luck in your blog future, I'm sure you will continue to be a success. If I get choosen email me at Fergie7399@aol.com, if not then I'm still going to get the cookbook it looks great! That looks delicious. I've got to get some strawberries soon. Congrats on your 1 year anniversary! That is very cool! Once again, I'm signed into the wrong google account so it won't show my avatar. This is Tiffany from Eat at Home. Happy Blogaversary!!! The strawberry shortcut cake looks amazing! I would love to win the book. Congrats on 1 year of sharing your great kitchen goodies. I always look forward to your recipes and pictures of your precious kiddos in the kitchen. Just found your blog and I love it! Yummy yummy recipes! My husband will not be happy :) He thinks I bake too much already and I'm going to make us fat! Looks like an awesome cookbook! Please enter me! and happy blogaversary! Happy Blogaversary! I love your blog! Thanks for all the wonderful recipes! Just found your blog a month or so ago and love it. Check out mine sometime, if you want! That cookbook sounds perfect for me! Happy Bloggaversary. This cake looks divine. I absolutely LOVE your blog! I am a mom to 21 month old triplet girls and I'm also in the Dallas area (Red Oak). I love cooking for my family and love trying new recipes. Happy Blogaversary! Keep up the great work, your readers/followers really appreciate it!! Happy Blogaversary! I really enjoy reading your recipies. I look forward to trying this one! Please enter me in the cookbook giveaway. I would love to be able to put that cookbook to use! I have a son who will be 1 year in July and just like another poster said, I know what it's like cooking with one arm. Congrats! You know I'm a huge fan and have made lots of your recipes and have not found a bad one yet :) Keep it up! What a fun cookbook. I'm typically a one-armed cook, so It would be perfect for me. Happy Blogaversary and keep up the good work! 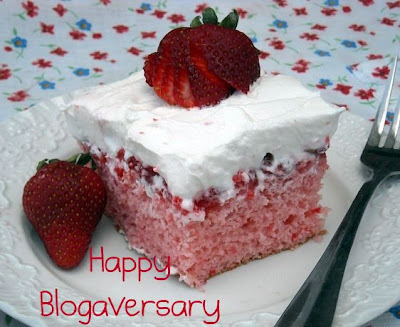 Happy Blogaversary!! (I hope I spelled that right!). I love your blog and I've made several things (my husband loves,loves,loves your Chili's Chicken recipe with bacon. He said he could eat it every night! I made the apple crisp in the cast-iron skillet and it was WONDERFUL!! I admit - I had three servings!! The strawberry shortcake cake looks great - I'll have to make that soon too!! Thanks! Happy Blogaversary! That cake looks great! That cookbook sounds good too. Not one I have seen before. The cake looks very yummy. I have to make it next weekend. As long as you keep posting recipes I'll keep[ coming back! Your description of the cookbook reminded me of one I saw at the book store called "one man one can one plan". LOL. Congratulations on your blogiversary. I love you blog and trying out your recipes. Thank you for the chance at winning this cookbook! Happy Blogaversary!I love your blog I don't comment every post but I do check your blog a couple times a week. I have tried a few of your recipes and they have always turned out wonderful. Congratulations on your blogiversary! Love your recipes! This looks wonderful! Fun blog! Hey neighbor..what a wonderful cake. Looks like you could eat it right off the computer screen. Great work. Happy Blogaversary!! I really need to look up when mine is.... lol! Have a great time!!! Happy Blogiversary! I found your website when I stumbled upon your recipe for Cake Balls over the holidays. I've been visiting ever since! Happy Blogiversary! I love your blog and all your recipes. Thanks for sharing with us! I would love to win the cookbook! Oh, I forgot to give you my e mail. Jebomini@aol.com- Thanks! Congratulations on your first year! I found your blog a few months ago, and I enjoy reading. The first recipe I made on here was the M&M Cookie bars. They were really good. Keep up the good work! *When I tried to leave my email, it wouldn't let me. I will just keep checking your blog for the winner's name. My sister just introduced me to your blog today!! The strawberry shortcut cake looks divine! Congrats on your blogiversary. (What a cool word - blogiversary.) I have enjoyed reading Mommy's Kitchen for about a month. Thanks for the givaway! Looooove your blog! We have had many yummy things to eat in our house because of you! Please enter me in your drawing. Congrats! You know I love ya girl. And boy that strawberry cake looks SOOOOOOOO good!! I just found your blog last week, I love all the recipes that I've seen so far! Thank you for sharing them! I can't wait to try some of them! Happy 1st blog anniversary and happy weekend. Congrats on your blogiversary. The strawberry cake looks yummy as do all your recipes. Is it too late to enter? If so, that's fine. I just wanted to say that I found this blog while looking for a recipe for soapapilla cheesecake and since then, I have made many of your recipes. Thanks tons for the great blog!! Your blog has really helped me learn how to cook. My mom didn't cook much and now that I am a soon-to-be-newly-wed, I wanted to have a domestic touch for my sweetheart. So thank you very much for doing such a good job. I would love to be entered into the contest...cds1484@gmail.com. Keep up the good work!! I really enjoy your blog. The cookbook looks great - please enter me in the giveaway. This is my first time to your blog, and I am anxious to explore it further. Your recipes sound so tempting. Thanks for sharing. Congratulations on your blogaversary! I've just recently discovered you and look forward to the upcoming year of recipes and pictures. I love your blog and check in several times a week to catch up on your recipes.. I have made so many things you have posted! I love your lovely recipes!! I think you are an inspiration to all of us!!! I wish you a lot of fun in blogging & creating yummie recipes for us to try out! I don't know if I entered the contest in time. You said it closed at midnight, but it's 9:17 here in California. I don't know which time zone you are referring to. So here's hoping I entered in time. Even if I didn't, that's ok. I love checking out your site for recipes for my family. Every one I have tried has been delicious and easy to prepare. Happy blogaversary! My children love strawberry shortcake! This is a lovely spin on it! Thanks for sharing and Happy Blogiversary! I love checking out all your recipes. Have tried several-lately chocolate pie and coconut pie(without eggs). Both were so good. Congrats on your 1st year. I hope you continue many more years so I can keep getting the great recipes.Please put me in for the cookbook. Donna email holland9962@bellsouth.net Thanks. Congratulations on your first anniversary of blogging! I just found your site and enjoy it sooo much but regret missing an entire year of your postings. Please enter me into the cookbook contest. Happy Blogaversary! I love your blog. I have tried many of your recipes, and never been disappointed. I'm definitely trying this cake! Thanks for all the inspiration Tina! Congrats to you! I think this cake is in my near future. Maybe Father's Day? I want to use some fresh strawberries that we pick this weekend. It sounds like something my mom used to make.